Head coach Matt Goode insists there will be no-one panicking at the DCS Stadium. 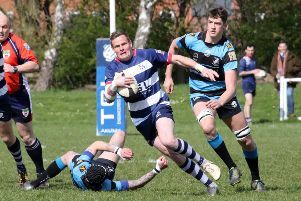 The Banbury Bulls coach has seen his side endure a torrid three weeks, three defeats and injuries to several key players. Bulls are without a game this weekend and Goode says that will give his squad time to recover in time for the next home game with Oxford Harlequins. Goode said: “We’ll have this week off and then look ahead to the game with Oxford Harlequins. All three defeats have come against the top three sides in the division. “I’m bitterly disappointed we didn’t get anything from the game at Old Centralians. Having lost to Newbury at home, that’s the only loss I want here this season, we’ll be turning a new page against Oxford Harlequins and push on from there. “It will be good to have a break and regroup. Both injuries to Dan Kirwin and Jimmy Manley were horrific to witness. Jimmy had his leg pinned on Monday but they’ve not put a cast on it so hopefully he may be back this season. “I don’t think the firm grounds have had anything to do with the injuries, we’ve just had an unfortunate run of them, we didn’t have any major ones last season. “It’s about how we deal with them and how we move forwards. But it’s been my toughest time since taking over as head coach. “We need to get the boys back enjoying their rugby and remember why we play this game. We’re not going to panic, we just need to work hard and get a run together again. Goode should be back to face Harlequins, Joe Winpenny pulled out in Saturday’s warm-up but should be back, as will Kallum Dixey and Duncan Leese while Pete Boulton, skipper Ian Isham and Chris Phillips will be available after missing Saturday’s game.